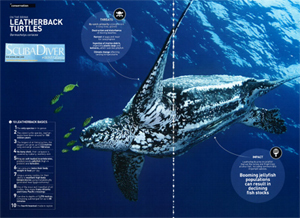 To educate the public about the leatherback turtle and explain the rapid spiral toward extinction it faces. To inform as many people as possible of this pending sea tragedy so that more people may be informed and join in a series of democratic actions to help reverse this extinction danger. 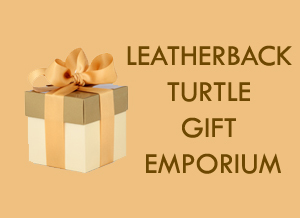 To facilitate a significant reversal in the population decline from the largest leatherback turtle nesting beaches by increasing the number of hatchlings which hatch, make it to the sea, and return to nest; thereby providing longevity to the species. 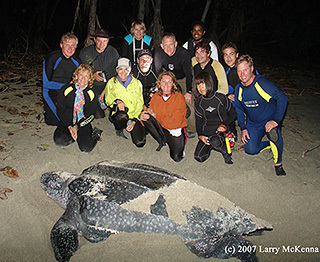 Our Expeditions since 2005 to the largest Leatherback nesting beaches have revealed a far more severe situation than has been reported by others. Baby Leatherback turtles and their eggs are being destroyed in vast numbers in their nests by global warming, egg poachers, and predators such as wild pigs and dogs. The result is a negative hatch rate, which places the entire regeneration of the species in the Ocean in jeopardy of extinction. We have a very few years to reverse the trend, or this gentle giant will be lost forever. Humans have a direct responsibility to correct this. Not only to save a beautiful and majestic species from extinction, but also, if we do nothing, the entire symbiotic relationship of the seas will be altered forever. How? Simply because zooplankton, floating fish eggs, and baby fishes will be consumed by the massive emerging jellyfish blooms worldwide to the extent that remaining global fish stocks will suffer greatly. Leatherbacks and other sea turtles prey on jellyfish; without them, jellyfish populations proliferate, resulting in even more imbalanced ecosystems. 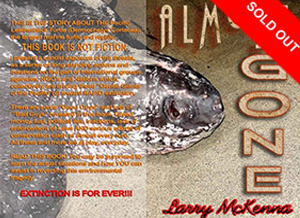 Predictions of "what might happen - if..." are now what is happening to our fish stocks along our coastal fishery areas. I was totally surprised at this Award. 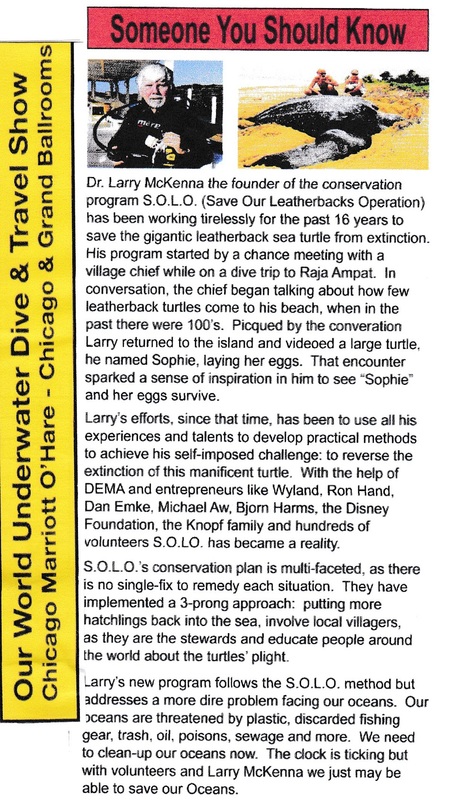 I dedicated it to all who have helped save the Leatherbacks - and to ask help with our NEW Mission... "Project Komodo"